Yesterday, I totally eavesdropped on a Twitter conversation (that’s the thing about twitter– thing is private) about lip balm swag. Call me a ditz, but I still can’t figure out why book promo stuff is called swag. If someone wants to enlighten me about this, I would be very happy. Lip balm is as easy as measure, melt and pour. You need a food scale and some good ingredients. A good recipe contains 20% beeswax, 25% solid at room temp oil (coconut oil, palm oil, Shea butter, lanolin, etc. 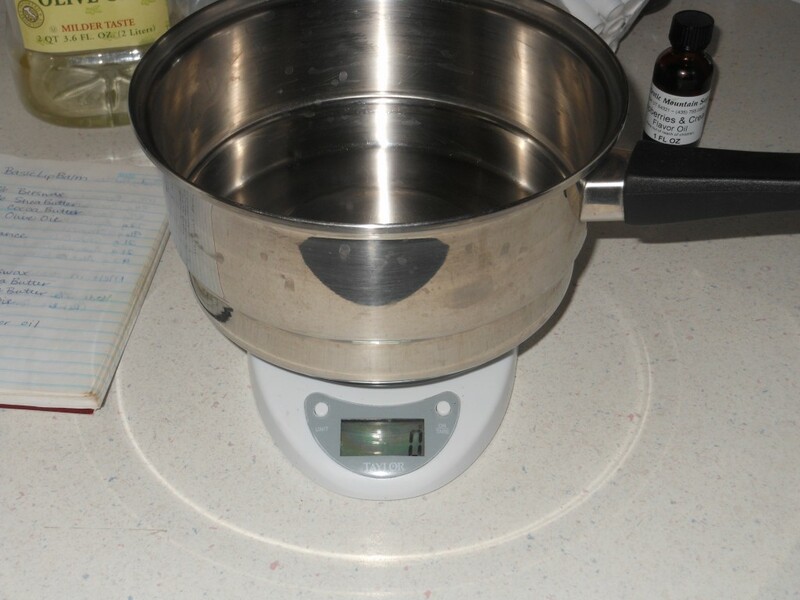 ), 15% brittle at room temp oil (cocoa butter, palm kernel oil, etc.) 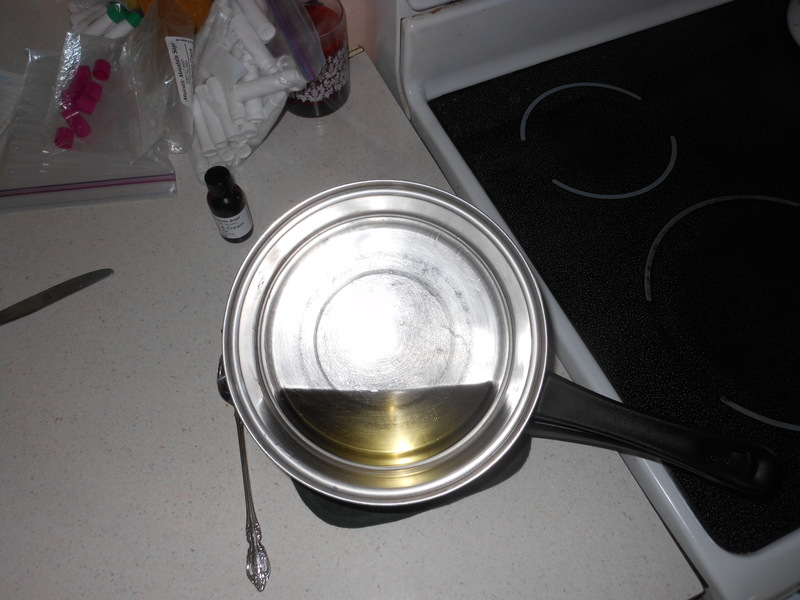 and 40% liquid at room temp oil (olive oil, avocado oil, sweet almond oil, etc). This recipe can be turned into grams easily: 20 grams beeswax, 25 grams Shea butter, 15 grams cocoa butter, 40 grams olive oil. (Or whatever oils you choose.) That will make about 20 tubes. I halved it for the demo today. I buy all my oils from http://www.thesage.com and I think they are very reasonably priced. They sell tubes, colorful caps and everything else you need. 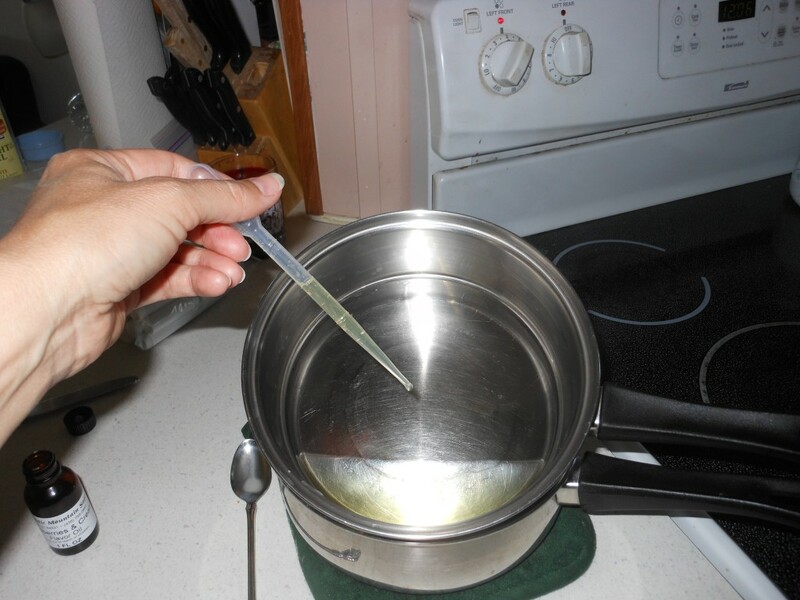 If you don’t want to invest in individual oils, you can buy a premade base. I haven’t used them, but the folks at MMS test everything and blog about it. If they sell it, it’s most likely a good product. 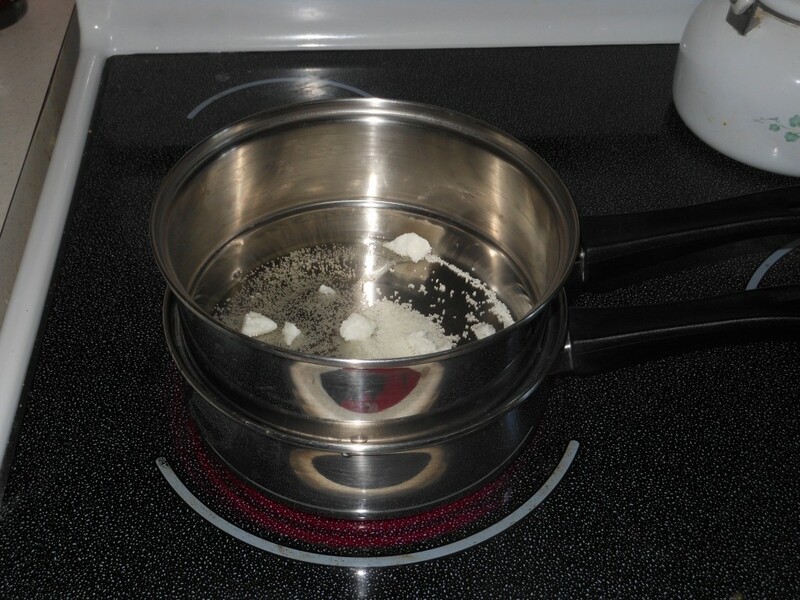 Put water on to boil, and set your pan on top. It will take only minutes for the ingredients to melt if you are making a small batch. This batch looks tiny, and it makes 10-12 tubes. Once the oils are melted, add flavor oil. This batch makes 10-12 tubes. A good rule of thumb is one drop of flavor per tube, so I add 10-12 drops. Mix well. Using the same pipette, fill the tubes. Filled and ready for caps. If you are using Shea butter, it needs to cool quickly, so I put them in the refrigerator after I cap them. Since Painted Blind has hot pink on the cover, I used hot pink caps. Also, around here I color coordinate my flavors. Hot pink is always raspberries & cream flavor. EEK! I ran out of hot pink lids. 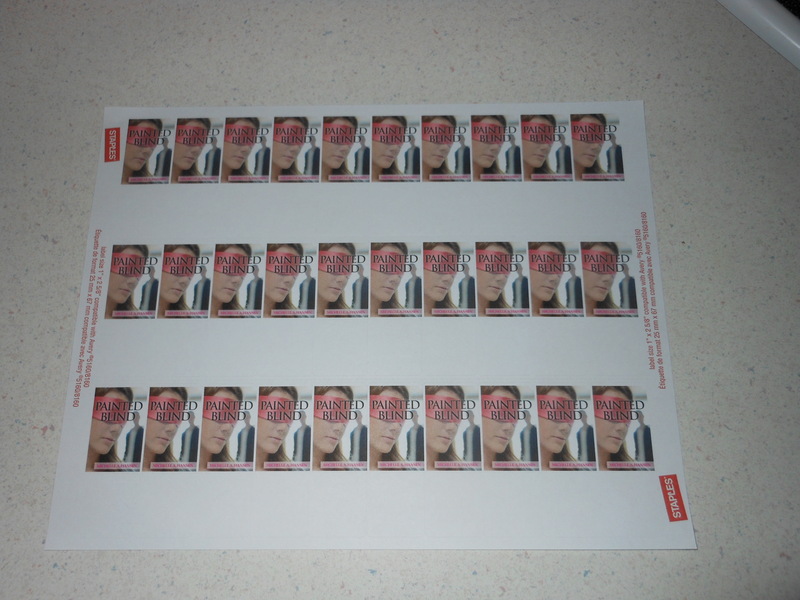 This is a regular sheet of address labels. I went to www.avery.com and put the cover art into the template and turned it sideways. Then I printed the sheet. 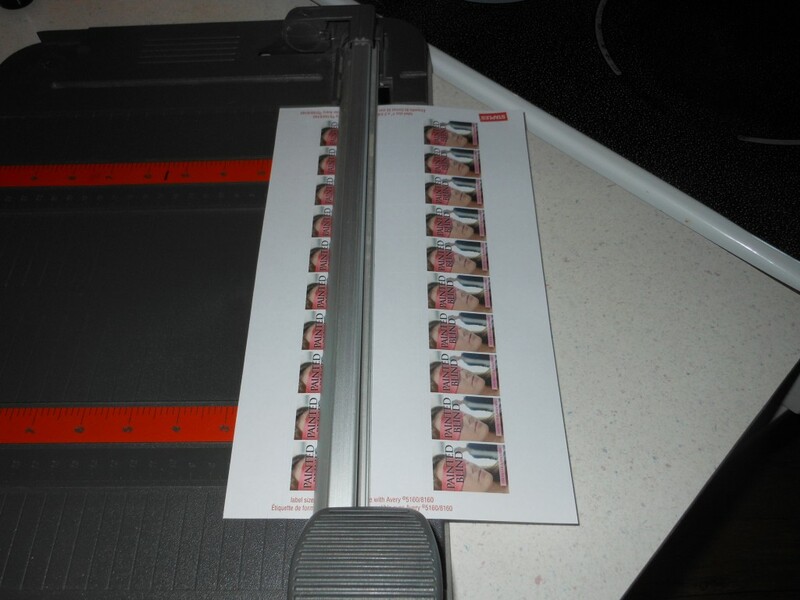 Trim off the excess white label. Place the labels on the tubes. Ta DA! Your book in lip balm. I love these. They are the BEST thing to give to teenage girls. No one passes on lip balm. Just some last thoughts. 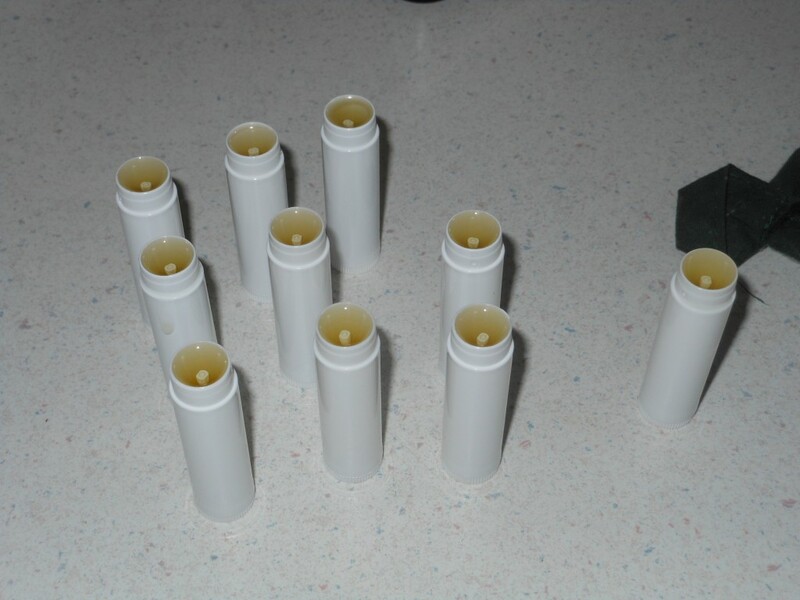 When I’m not trying to take photos and blog it, a batch of lip balm takes me about 10 minutes. Skin care products are not like food products. You don’t have to make them in a commercial kitchen, just a clean environment. I priced out all my oils, divided up the costs and added in the tubes and lids last year to find the bottom line. 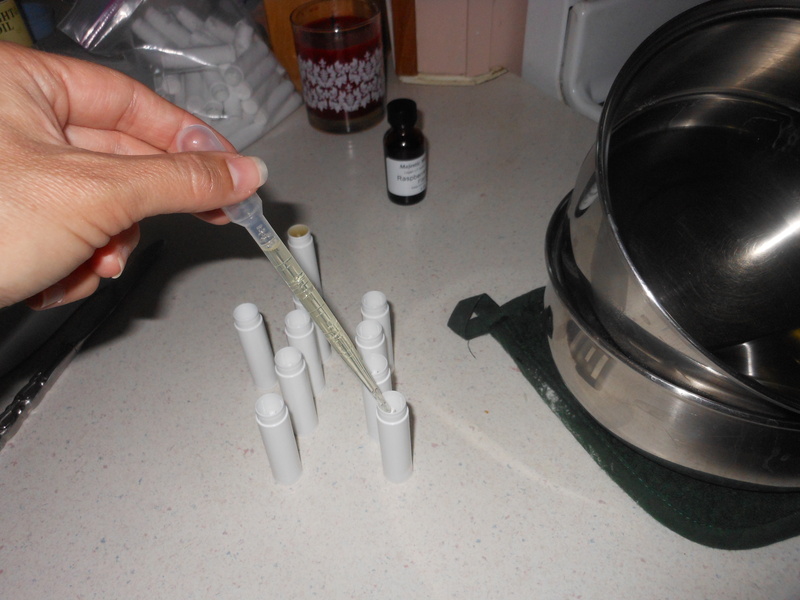 It costs me about a quarter to make a tube of lip balm. That number would be higher if you used a premade base, but you would have a considerably smaller investment. (I buy oils in 5 lb buckets which DOES NOT make sense if you are only making lip balm.) 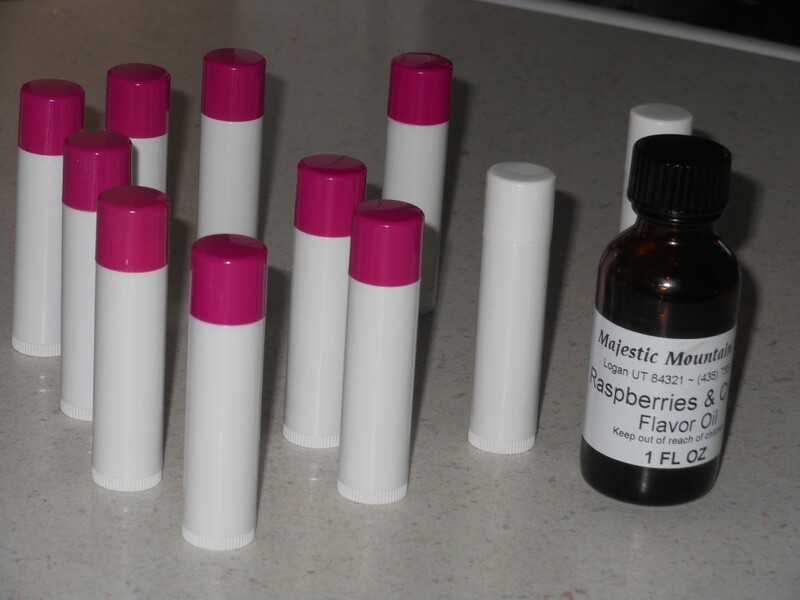 Plus, you are getting a handmade, AWESOME lip balm that you will love to use. I would recommend buying 100 tubes and 100 lids of one color and a single flavor oil. 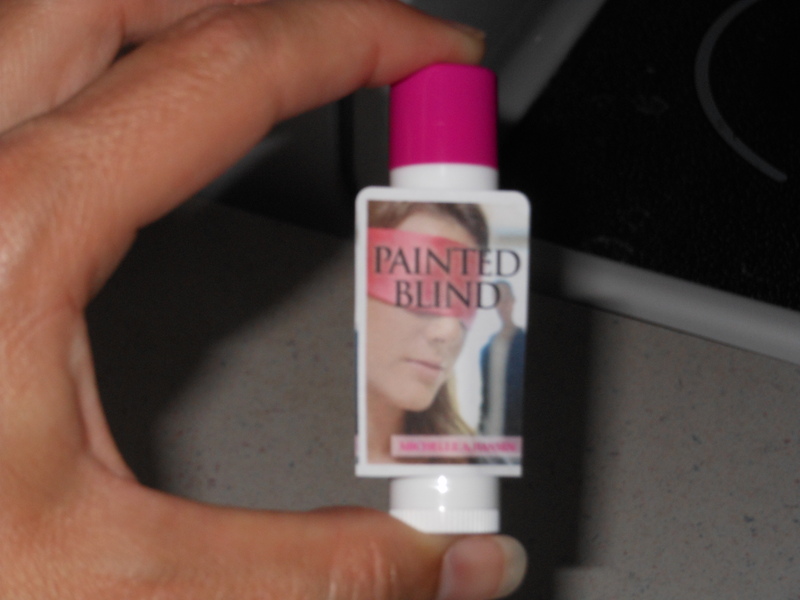 Coordinate your flavor & lid with the colors on your book cover. They also have black tubes and lids. MMS is a one-stop shop. I love them. Plus, if you have questions, you can call them and they are very, very helpful. If you have any questions or comments, please leave them for me and I will follow up. You can email me specific questions in the contact tab also. Have fun! Oh, and post pix if you try it. I want to see! I can’t thank you enough for taking the time to do this. I’ve learned something new today, that’s for sure!